Weight: 3 lbs 13 oz. 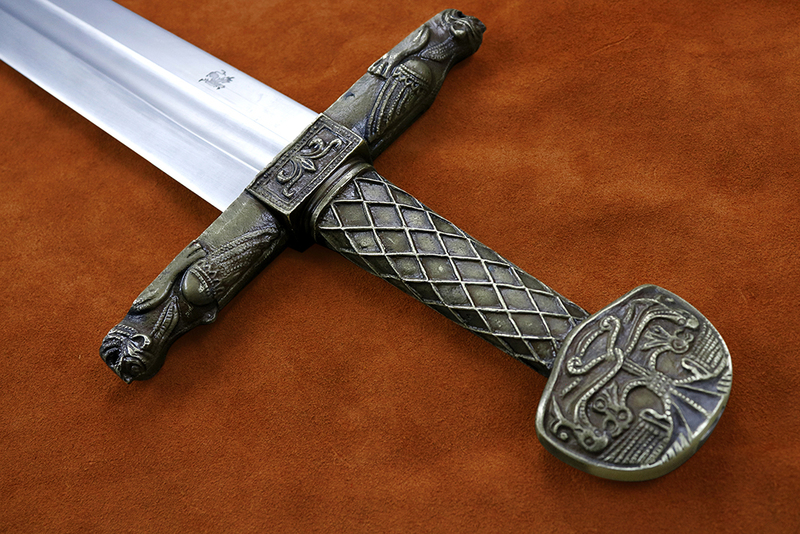 Some famous swords known to popular culture are historical artifacts; for instance, the sword of the Black Prince, or the arming sword of King Henry V. Still others are known to us because of myth; Excalibur, for example, or Hrunting, the sword of Beowulf. 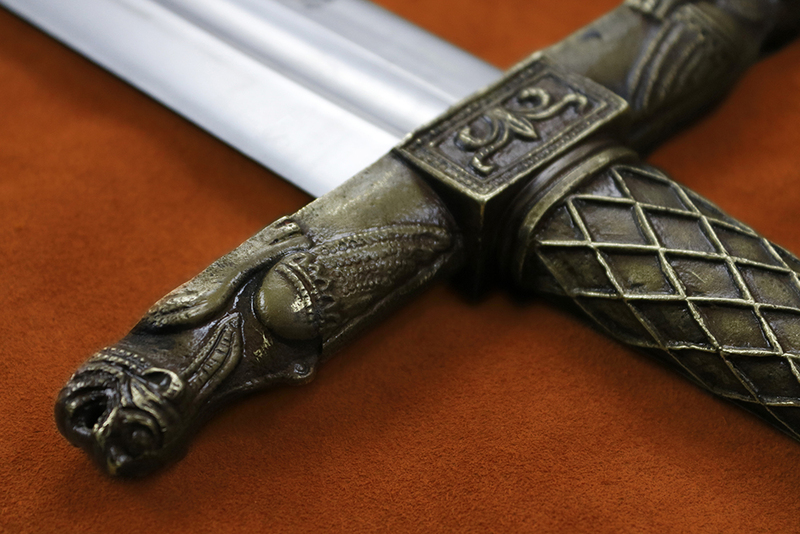 Rarest of all, though, are the swords in which history and legend meet, and overlap, and leave us with an artifact rooted in history and wrapped in mythology. 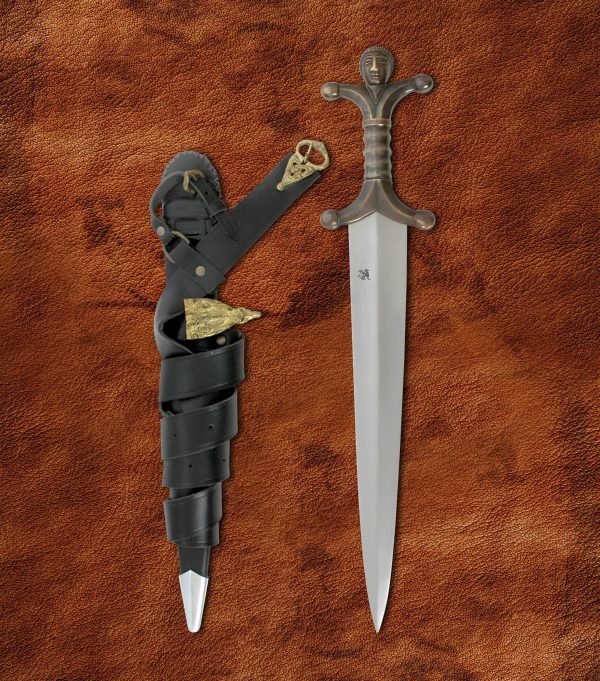 The sword of Charlemagne, first emperor of the Holy Roman Empire, is one such legendary weapon. Charles I was the eldest son of the Frankish king Pepin the Short. After his father’s death he became king, beginning his rule over the Franks when he was only in his 20’s. A highly religious man, he began a campaign to strengthen the position of the Catholic Church in Europe. This led to military campaigns against the Slavs, the Moors, and a 30-year religious war against the Saxons that served to establish his credentials as a leader and military commander. It was these actions that united Western Europe into the Holy Roman Empire, an Empire over which Charlemagne was made emperor in the year 800 CE by then Pope Leo III. Some historical sources suggest that Charlemagne was unaware of the Pope’s plans to make him emperor and took the seat with reluctance – this has been disputed by many historians. Charlemagne was to rule the empire for 14 years, and despite his sometimes brutal military campaigns he also made many educational reforms – creating libraries and expanding budgets for schools, as well as increasing the perceived value of literature, scholarship, and music. Upon his death the empire passed to his son, and he was buried in a cathedral in what would one day be Western Germany. The history of Charlemagne contains a strange mix of fact and fiction, and nowhere is this more evident than in the tale of his sword. The fate of Charlemagne’s sword remains unknown; however, a sword that is purported to have been his has been used at the coronation of French kings since the 12th century. This sword was kept with other articles of ceremonial regalia in the royal abbey of Saint-Denis and brought out for ceremony. Moved to the Musée du Louvre in 1793, the artifact – now referred to as the true Sword of Charlemagne – was used one last time at the coronation of Charles X before being retired to the Louvre where it remains to this day. 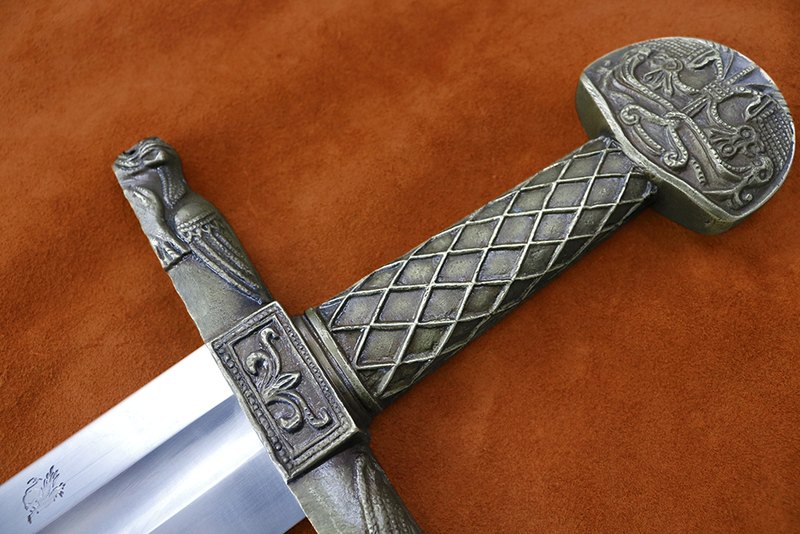 While the identity of this sword as belonging to Charlemagne is unconfirmed, it is certainly a piece of stunning beauty. 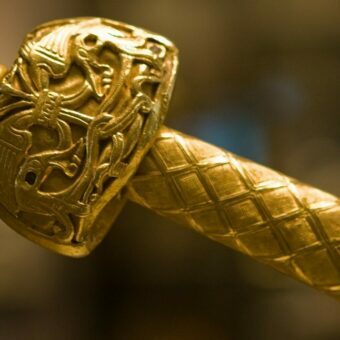 The famous golden handle appears to be a composite piece – the winged dragon crossguard, for example, is from the 12th century, while the handle appears to have been made in the 13th or 14th century. 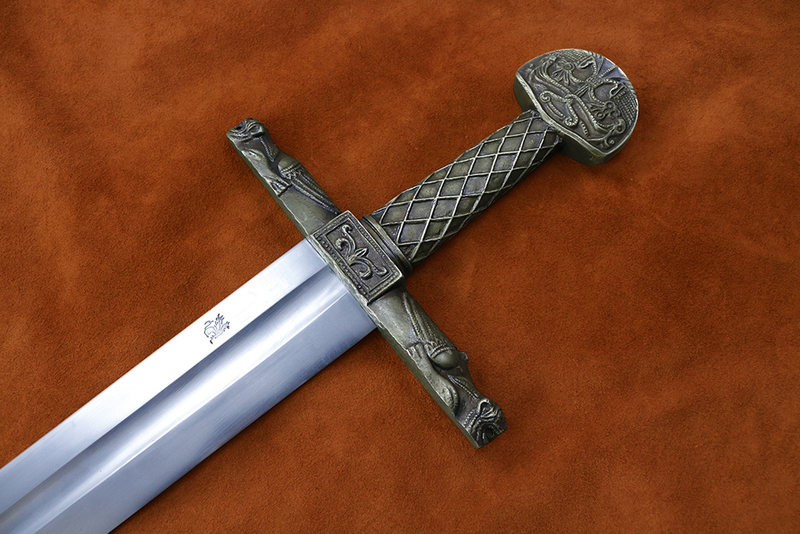 The pommel, however, appears to be ornamented in the style of 10th or 11th century Scandinavia, suggesting it may be the oldest piece of hardware on the sword. The age of the blade is disputed, with dates ranging anywhere from the 9th century (making it possible to have indeed been Charlemagne’s sword) to the 13th century (putting its identity as the fabled Joyeuse in doubt). 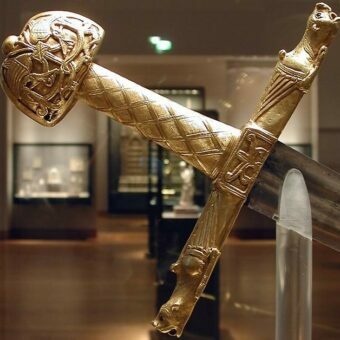 Despite its uncertain origin, the sword currently displayed in the Louvre is carries a rich history and is traditionally associated with the sword carried by the first emperor of the Holy Roman Empire. 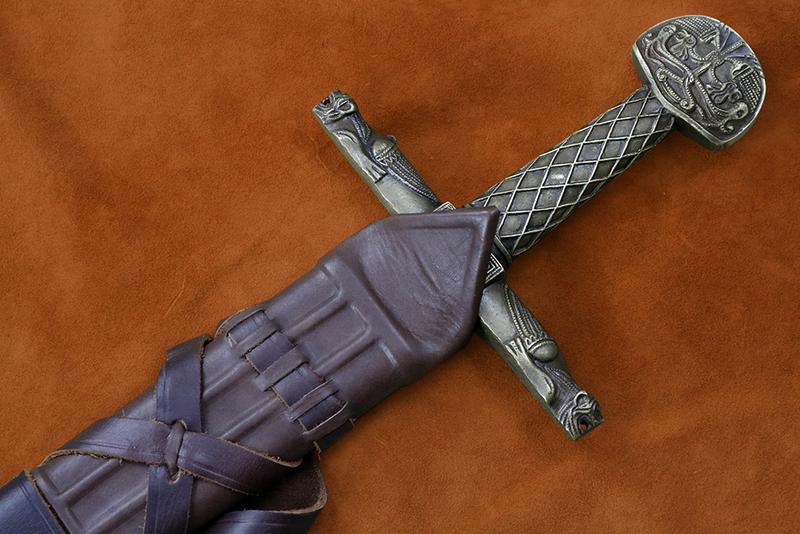 The Darksword Armory Charlemagne Sword is one of our most anticipated project to date, and has been in development since Darksword Armory founder Eyal Azarad’s visit to the Louvre. A broad, solid blade with a single fuller matches the antique on display, and is made from 5160 high carbon steel as are all our blades. The tang for this sword was made especially thick in order to provide additional stability. The hilt furniture, however, is where the quality of our work truly shines. 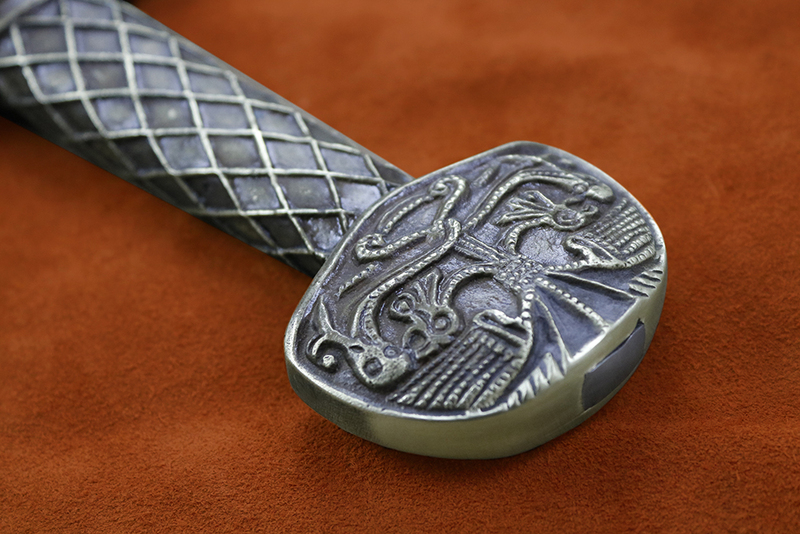 The original handle, cross guard, and pommel are made from gold, and many modern reproductions use brass or gold-plated metal; Darksword Armory uses the lost wax process to cast the hilt furniture out of bronze. The incredible detail on our version of Joyeuse, one of the only battle-ready versions of Charlemagne’s sword available today. We hope that you will enjoy our take on this sword of history and legend.